Parts I and II of this series looked at the system of education and other public services implemented by IS in Ninawa province. What then of religious life and public morality under Shari'a? The Diwan al-Hisba has IS' "Islamic police" under its wing and is responsible for the enforcement of public morality. It is one of the more familiar departments of IS administration: for example, if someone is caught in possession of alcohol, cigarettes or drugs, then that person is to be apprehended by the Islamic police and in theory sent to the Diwan al-Hisba, which will then decide on the appropriate punishment. In such cases, a flogging is the standard punishment, though the Islamic police may sometimes implement it immediately on the spot. The Diwan al-Hisba also works with other departments such as the Diwan al-Siha, having helped to devise the price controls on pharmaceutical goods. Shutting of shops during Friday prayer and [Prayer] Assemblies. Prayer is the second pillar of Islam, and is the most beloved of deeds for God, and undertaking it with the assembly is among the greatest acts of worship and the surest of obligations, the evidence being from the Qur'an- the word of God Almighty: "When you are among them and lead prayer for them, let a group of them stand with you. "- 4:102...[further]: "And let another group come forward that has not yet prayed and let them pray with you"- 4:102. This is the evidence for the obligation, because God has ordered them to gather for it and they are in a state of fear [of God], and the hardest state for the meeting to be in is one of fear. The use to be drawn from the aya [verse of the Qur'an] is that prayer of the assembly is fard ul-ayn [obligaton incumbent on every Muslim]. The evidence from the Sunna is a hadith on the authority of Abu Huraira: he said: "The Messenger of God said: "Indeed the heaviest prayer on the munafiqeen [lukewarm/hypocrites] is the evening prayer and the dawn prayer, and if they knew what was in them they would have attended even if they had to crawl, and I should wish to order for prayer to be established, then order a man to lead the people in prayer, then I would go with some men carrying bundles of wood to people not attending prayers and burn their houses upon them with fire." [Sahih Muslim]. 1. The closing of the shops is from the time of the hearing of the call to prayer, so no delay is allowed in that except in extraordinary necessary circumstances that can be accounted for. 2. The specification of closing time for shops is 15 minutes for sunset prayers and 20 minutes for the rest of the obligatory prayers, and that is from the time of the entry of the call to prayer. 3. The closing of shops begins from going to prayers on Friday...until the end of the preacher's sermon. 4. In the event of contravention of this decision coming from the Diwan al-Hisba in which the considered Shari'a interests have been taken into account, the one contravening will be subject to consequences legitimate according to Shari'a resulting in the closing of his shop for a decreed period, with the rest of the necessary proceedings to be undertaken with regards to that person. 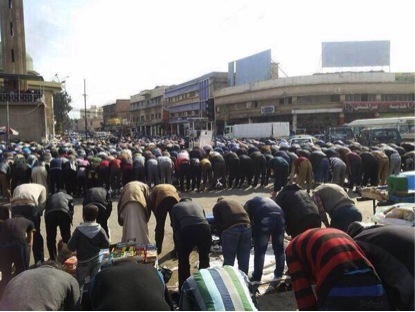 The IS emphasis on prayer assemblies has been made clear in photographic evidence from its strongholds, particularly Mosul's Syrian counterpart of Raqqa. In Ninawa province, the Diwan al-Hisba's closing of shops was advertised in a recent video put out by IS' Ninawa media office. 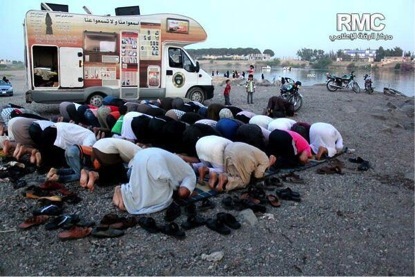 Prayers by the banks of the Euphrates in Raqqa, next to an IS da'wah vehicle. 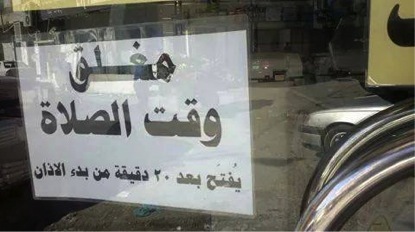 Photo purportedly from Mosul reflecting the IS order to close shops during prayer time: "Closed: Prayer time: will be opened after 20 minutes from the beginning of the call to prayer." The Diwan al-Awqaf wa al-Masajid is the administration responsible for dealing with waqf property endowments, as well as management of mosques and religious institutions more generally. 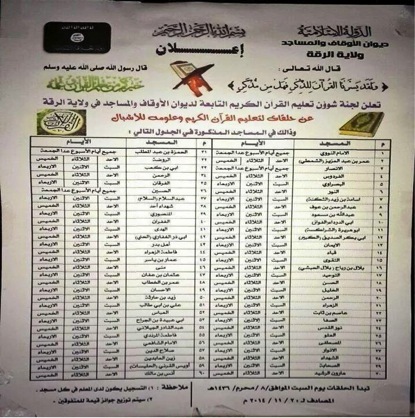 This IS department has also notably appeared in Raqqa province, giving a timetable of teaching of the Qur'an sessions for children in the various mosques of Raqqa, as per the photo below. In a similar vein the institution name has appeared among the IS-aligned jihadis of Derna in Libya, who issued a call for public pledges of allegiance to Abu Bakr al-Baghdadi. God has blessed us with the establishment of His law and the rule of His book [Qur'an]...and on that we inform you that the Shari'a judiciary has opened its doors and the Shari'a judiciary has decided on rule by the book of God and so it is not allowed for anyone to assume its place in any form like the holding of marriage according to Shari'a which is of the right of the Shari'a judiciary, thus holding marriage outside the Shari'a court is forbidden, and the one who contravenes will subject himself to inquiry. The reception of these issues will be done without a queue management system [?] but rather in an easy and direct manner in the Dar al-Qaḍa (judiciary base) in the Shari'a court on the left side of the Mosul [i.e. eastern Mosul] in Wilayat Ninawa. "Dar al-Qaḍa: The Islamic Court for Wilayat Ninawa: The Left Side [of Mosul]." The Diwan al-Masajid of Ninawa province also announced the opening of a women's Shari'a institute in Mosul in October 2014, working with the Diwan al-Ta'aleem that oversees education in Ninawa province. The women's Shari'a institute has ample precedent elsewhere across IS territory. A women's Shari'a institute in the Manbij area, Aleppo province. Sample mural: "The hijab is a duty like prayer." It was opened on 22 March 2014. After the success from God- Almighty and Exalted is He- and His blessing on the believers and monotheists, your brothers previously in the Diwan al-Masajid opened the Shari'a institute for men to graduate preachers and students of Shari'a knowledge. And since women are the partners of men, your brothers in the Diwan al-Ta'aleem for Wilayat Ninawa/Mosul Area have opened the Shari'a Institute for Women to teach the Shari'a sciences, among them: the Noble Qur'an, the Sunna, the Life of the Prophet, Shari'a fiqh [jurisprudence]. This will be done at the hands of excellent female professors and sisters. Reception of female students of 'Ilm [Shari'a knowledge] will begin from 23/12 [23 Dhu al-Hijjah 1435 AH?= 17/18 October] and last for a period of 10 days. And the period of Shari'a instruction will be 3 months, if God wills. And reception of female Muslims will be done in the base of the Diwan al-Masajid located on the right side of Wilayat Ninawa [i.e. western Mosul] in the Prophet Seth area. The opening of the Shari'a institute for men mentioned in Specimen C was announced in a Diwan al-Masajid notice in the same month. The Almighty has said: "It has not been for the believers to go out as a whole company to battle, but rather there should separate from every division of them a group to study jurisprudence in the religion and warn their people when they return, that they may be aware. "- Qur'an 9:122. And from Ibn Abbas (may God be pleased with him): the Messenger of God said: "The one God wishes best for is the one He teaches jurisprudence in the religion"
And in this is a raise for the people of 'Ilm, and an increase in their nobility, and a statement of their favour, and they are in every time and place leaders and esteemed persons, rendering back and calling the people to God. On this basis and premise, the Diwan al-Masajid in the Mosul area announces the first session of lessons for the Shari'a institute to prepare preachers and teach the Shari'a sciences and reception for applicants to the institute will be in the public base of the Diwan in the Prophet Seth area at 9:00 a.m. sharp on Saturday 24 Dhu al-Hijjah 1435 AH corresponding to 18 October 2014, and the registration will continue until Thursday 29 Dhu al-Hijjah 1435 AH corresponding to 22 October 2014. 1. The applicant should not be younger than 18. 3. Should be characterized by the qualities and manners of a student of Shari'a knowledge. The IS religious institutions are of particular interest because they had forerunners in the era before IS control of Mosul (at which point, IS was still just the Islamic State in Iraq and al-Sham: ISIS). ISIS and its predecessor- the Islamic State of Iraq (ISI)- had entrenched itself in Mosul as the mafia, extorting money from most businesses. ISIS therefore displayed itself in the shadow of central government control with less developed bodies, most notably a more general 'Shari'a Committee' for the Mosul area that would exploit ISIS' soft power to try to influence locals in its direction. For example, the Shari'a Committee issued a statement on 4 August 2013 on the issue of women not dressing properly according to Shari'a and the dealing in this improper dress by Mosul's shops. More recently, in March 2014, the Shari'a Committee distributed a statement to Mosul's mosques warning against participation in the parliamentary elections, affirming: "Participation in the legislative elections is approval of kufr [disbelief], and it is not allowed for man to come upon kufr by choice under any circumstance except with the goal of removing oppression or realizing the interests of the Ahl al-Sunna" [by implication, no one aiming for such objectives in Iraq's political system]. The statement also denounced elections as the "rule of the majority" going against the words of God. Immediately after the fall of Mosul, ISIS quickly established a "Committee for the Administration of the Affairs of the Mosques" that likely served as the direct predecessor for the Diwan al-Masajid. Control of the mosques in the face of competition with rivals is often the first step to asserting one's power, and well before the fall of Mosul, ISIS had been competing with other insurgent groups like Jamaat Ansar al-Islam (jihadi rivals of ISIS) for influence in Mosul mosques. It should also be noted that the first major display of power in Mosul came after the Caliphate declaration, with Abu Bakr al-Baghdadi's appearance in the Grand Mosque in Mosul. Like the Mosul 'city charter' that made clear in particular the rejection of Ba'athism and the 'Safavid' government of Baghdad, the ISIS statement below to Ninawa mosques makes very clear the intent to exclude all other insurgent groups from involvement in the affairs of the mosques (see in particular points 5-6). Praise is due to God for His grace and generosity with what He has granted to His servants with this manifest victory and achievement for the Islamic State. Thus we have congratulated the Muslims. May God bless His monotheist servants, and may God prolong this bounty and render you and us among those faithfully working in this great structure under the shadow of the Islamic State in Iraq and al-Sham. May He preserve it as a treasure for Islam and the Muslims. God Almighty has said: "Those who, if we have given them authority in the land, have established prayer, given zakat, enjoined what is right [virtue] and forbidden what is wrong [vice]. God has the outcome over the matters"- Qur'an 22:41. 1. Opening of the mosques and establishing Friday prayers and assemblies according to the Book [Qur'an] and Sunna. 2. Put aside bida' [innovation], errors and modernisms. 3. Call to friendship and mutual mercy among the Muslims and spreading the spirit of affection and cooperation. 4. The next Friday sermon: the situation will be regularized on the subject of the city charter exclusively. 5. No participation and joining in the establishment of any group to protect the areas and raise any banner besides that of the Islamic State, or in any form [for that matter]. The protection of the Muslims and their interests is among the first obligations of the soldiers of the Islamic State. 6. No publication or broadcasting of any statement except that coming from the Islamic State in Iraq and al-Sham. 7. 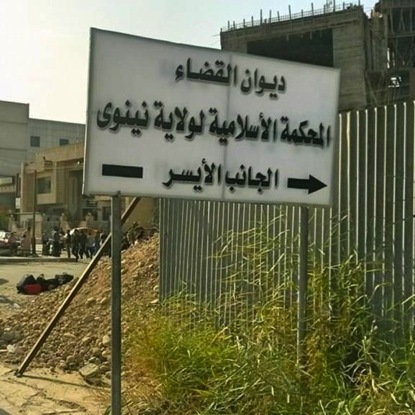 The acceptance of the repentance of the apostates in the Mosul area will take place in all of the Omar al-Aswad mosque (the right side) and the al-Sabireen mosque (left side) in al-Wahda neighbourhood beginning from Saturday 16 Sha'aban 1435 AH [14 June 2014]. At this stage, there is nothing to distinguish religious life and public morality in Mosul and the wider territory of IS-held areas in Ninawa province from IS practices elsewhere in its self-proclaimed Caliphate. Any notions of 'restraint' based on the false assumption of a supposed 'alliance of convenience' with other insurgents, in particular the Ba'athist-Sufi Jaysh Rijal al-Tariqa al-Naqshbandia, need to be abandoned. Ninawa province and the history of IS' religious bodies and presence in the area also provide an interesting case on the evolution of the group's status from the 'mafia of Mosul' lurking everywhere in the background to the ruling authority with more developed institutions to enforce its vision of a society governed in its totality through Islamic law.